February 2016 – He Said What?! Pleroma….described the ship’s complement. 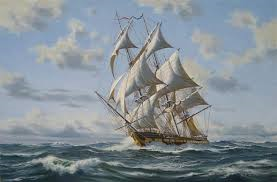 Before leaving port the vessel was carefully checked to ensure that there was an adequate crew and that the cargo included sufficient food, drink, medical supplies, spare cloth to replace torn sails, ropes, in fact everything necessary for its journey. That was the ship’s complement or completeness. A departing ship today, and especially in ancient times, definitely had to be careful to have all necessary supplies before sailing. No ship would leave for a journey until it was filled with supplies….filled with all it needed for the time on the open sea. OK, so why was this word such a blessing to me today? And why do I pray that it’s a huge blessing to each of you reading this as well? John’s Gospel began by assuring its Christian readers that, however great the pressures of life, all their needs would be met out of the abundant completeness and inexhaustible sufficiency of Christ. You see, God doesn’t push His children out on life’s voyage without preparation. Just like a ship being loaded up in the dock before setting sail, so God loads us up with all that we need for the ride that is ahead of us. We don’t even know that He’s doing all that work on us most of the time. All the equipping and the completing comes as we live day by day, getting to know Him better through His Word and through the growth that comes with each new trusting time in our lives. Then the waves come crashing in and the journey is long. The ocean is big and scary. Don’t think that when you’re slammed in the face with an unexpected trial, God didn’t know beforehand that it would come. He knew. He in His sovereignty ordained and allowed it. But not before He prepared you for it. God completed you, and is still completing you, with all that you need for the rough waters all around you. Grace upon grace. Unmerited favor from God, over and over again. Blessing upon blessing as we sail through the waters and as we experience God’s complete provision for all we need, before we even knew we needed it. God loves His children. He’s a good God. He would never leave us incomplete, lacking what we need. He alone is really all we need. So even when we don’t understand our situations….or don’t like them….or are hurting….afraid….turned upside down…. You are complete. You are filled. You are ready to sail! Trust your Captain. He’s got your course all charted, and He’s got you more equipped than you realize. Of His fullness we have all received. Author hesaidwhatksPosted on February 22, 2016 February 29, 2016 Categories Devotional, Fear, God's Word, Grace, Peace, Strength, Trials, Trust3 Comments on Set Sail! You Might Live With Autism If…. · You poor one cup of coffee for Aaron, knowing that he always has three cups. You tell him that you are brewing more coffee and will pour his other two cups when the fresh coffee is ready. But he won’t let you take the one cup to his room until the other two are poured and ready to go. You don’t take ONE cup of coffee to his room…..ever! You take THREE cups!! 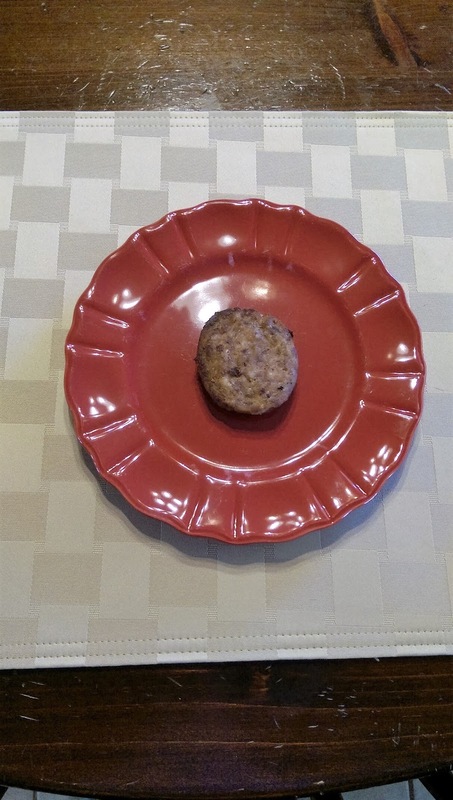 · You hand him a piece of sausage that he wanted in a napkin, to be eaten similar to a cookie. Silly you! Sausage goes on a plate, not in a napkin. You just do it with no argument, because you know that arguing about these critical matters is useless. · Aaron has watched four seasons of The XFiles. For Christmas he received the remaining five seasons. He decided to finish watching The XFiles, but instead of starting with season five, he is going to start watching from the beginning – again. You try to talk him into just starting with season five since he’s already watched the first four and he seems to agree, but later walks back into the room, obviously in discomfort. You give your blessing to him starting with season one, despite how long it will take now to watch the entire series….because you know he’ll do it that way anyway. So you may as well remove the burden from his shoulders and let him fully enjoy the ENTIRE series, watched the way he wants….all together the way they should be. Aaron – Will you get me up? Me – Sure. What time do you want up? Me – OK, I’ll get you up before 1:00. Aaron – What time is that? Me – I don’t know. Just sometime before 1:00. What time do you want that to be? Aaron – I know! Get me up at 1:00. Aaron – How about 12:30? Me – 12:30? Are you sure? Aaron – No. Let’s do 1:00. Trust me. I got him up at 1:00. Not 12:59. Not 1:01. · Aaron has a bad headache after having seizures. While we changed his sheets, because it was Saturday and we always change sheets on Saturday, I asked him how his head was feeling. He told me it still hurt, so I made a sound of concern. You know, a soft murmuring sound…..mmmm. 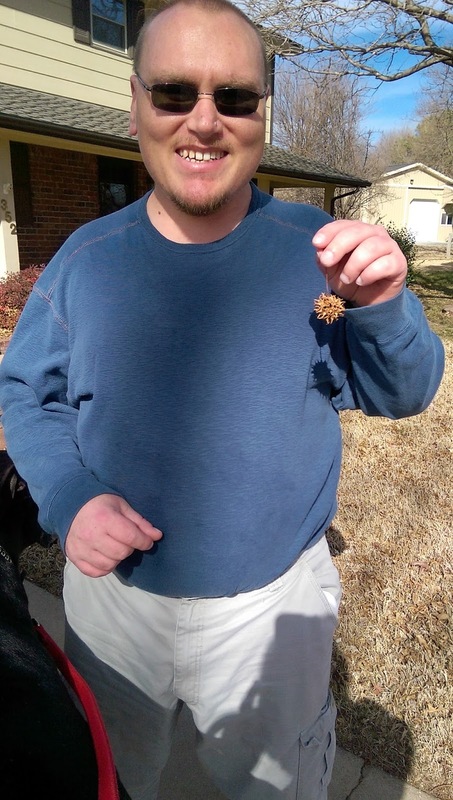 Aaron’s response: “You’re weird, Mom.” He doesn’t appreciate soft murmuring sounds of concern….or crying…..or most hand gestures…..
· You go on a walk with Aaron and he finds a “thorn seed pod,” as he calls it, and he carries it proudly home. It is given a place in his room among all the other treasures he has found on walks, in stores, at his day group, etc. 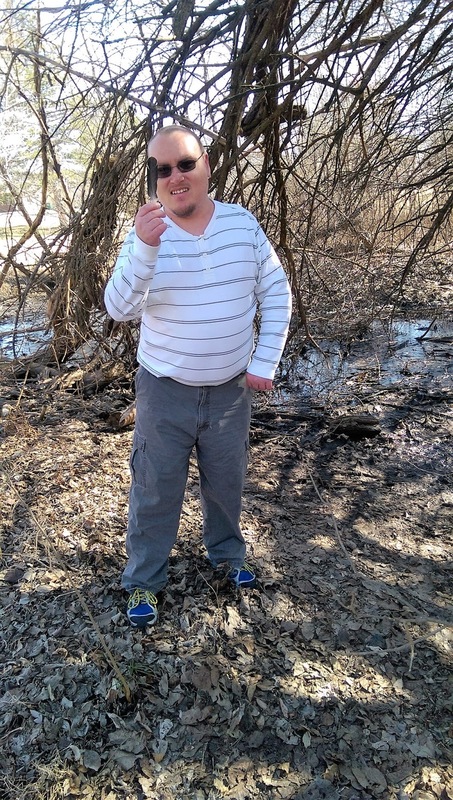 · You go on another walk and Aaron finds a feather this time, which he carries for the remainder of the walk, trying to feed it to our Great Dane…who has no interest in feathers that anywhere matches Aaron’s. 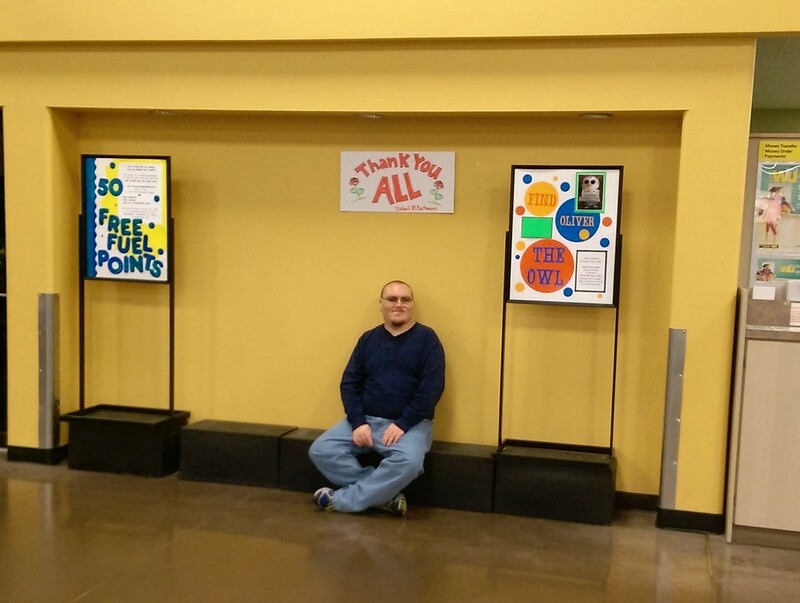 · You go to the grocery store and as you look up from the self check-out register, you see Aaron sitting on the empty display shelf in the front of the store. Smiling. Content. Not one bit embarrassed. “How come you say only Dad can call you babe?” he asks for the zillionth time. And for the zillionth time, I know that life will never be mundane or usual with Aaron. · You know it’s really all right that life will never be mundane or usual with Aaron. Most of the time it’s fun. · And thinking of what Aaron says, not all the time but most of the time, makes you smile. Author hesaidwhatksPosted on February 21, 2016 February 28, 2016 Categories Adult Autism, Asperger's Syndrome, Epilepsy, Family, Special Needs AdultsLeave a comment on You Might Live With Autism If…. Several years ago I wrote this short piece about Aaron and the covers on his bed. Helping Aaron change his sheets today reminded me once again of another characteristic of Aspergers – an insistence on sameness. Aaron wants every wrinkle pulled out of his covers when we’re putting them on his bed, and there is one smaller blanket that must be centered. Not only that, but he likes several blankets, in addition to his sheet, and they must be put on his bed in a particular order. 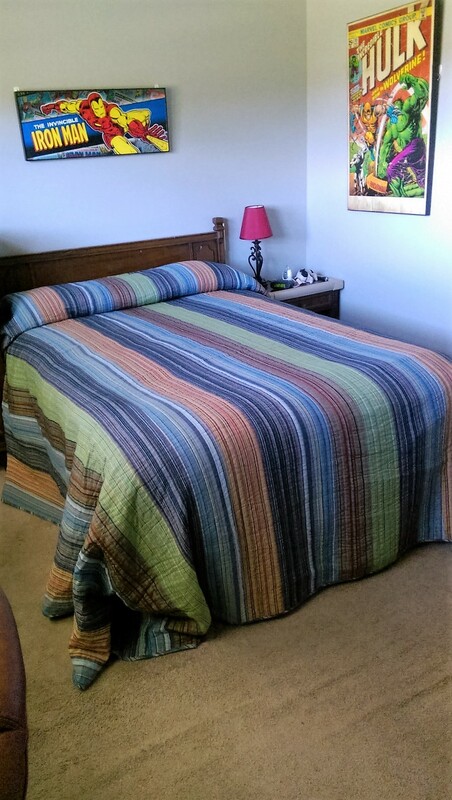 I remember once, several years ago, that as I helped him change his sheets I decided that there was a better order for the blankets to be put on the bed. My order made it easier to tuck the sheet and blankets under the mattress. So I matter-of-factly showed him my plan as I changed up his plan for the Order of the Covers. He said he didn’t like it. So very patiently I showed him again that my Order of the Covers was a good Order of the Covers. The same covers were included as always but in a different order. Aaron stood there pondering and the only word that he heard, as I would soon discover, was the word “different.” Not the word “better” or the word “good,” but only the word “different” – which is not a favorite word of Aaron’s. He complied with my plan at that time, and so we completed the bed making with the new Order of the Covers. I trotted happily on my way without giving that exchange a further thought. Until the next morning. Aaron usually makes his bed before leaving the house, but something that next morning didn’t seem right about his bed and so I took a look. AH HAH!! After we had gone to bed the night before, Aaron got up and changed the Order of the Covers back to HIS Order of the Covers. “Well, well, well,” I thought. Two can play this game! And I changed the Order of the Covers back to MY Order of the Covers. HaHa! That’ll show him! Neither of us said a word that night before bed, but don’t you know that when I got up the next morning he had changed the Order of the Covers back to HIS Order of the Covers again?! We went back and forth then for several days in our silent battle over the Order of the Covers. Finally, though, I faced reality. Did I really want to spend the rest of my life remaking his bed every morning? Was this issue really worth that? Nah, I didn’t think it was. I conceded. He won the Battle of the Order of the Covers. Good grief, I may as well admit it. He won the whole war! 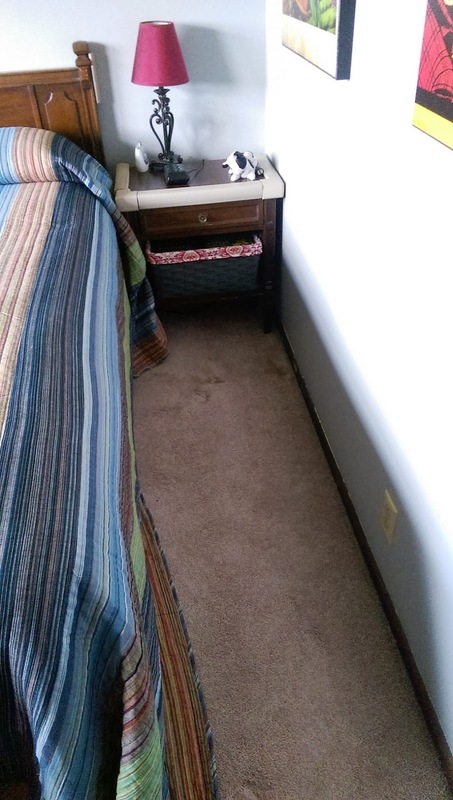 Well, as of last August Aaron has a newly painted room along with a new bedspread, new valence on his windows, new pictures on his walls….new, new, new! 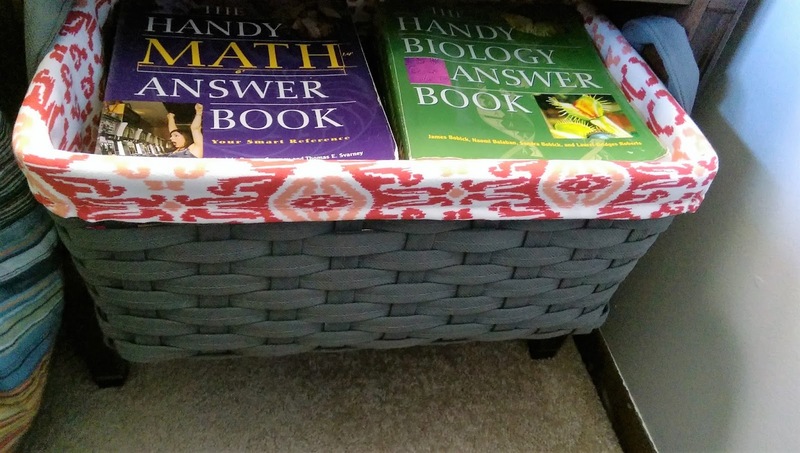 I wrote about his insistence on keeping his books on the floor beside his bed, despite the NEW lined basket that I have in his night stand for just that purpose. Aaron doesn’t really care about new lined baskets nearly as much as he cares about his routine of keeping his books and notebooks on the floor beside his bed in a tidy little row. 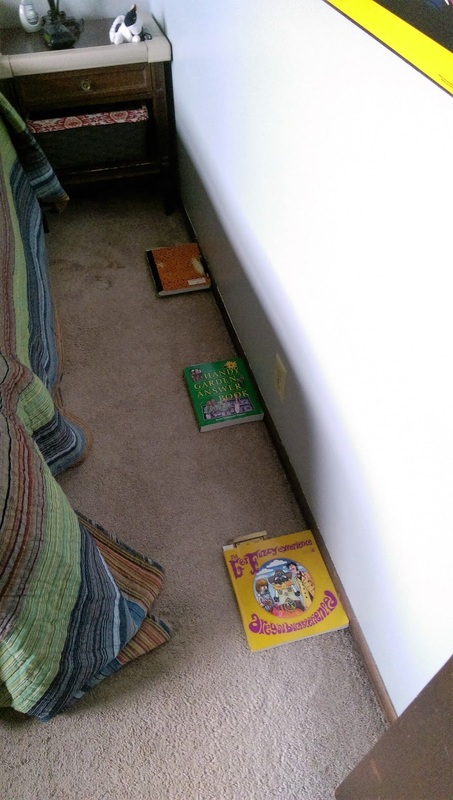 So just like I quit fighting the order of the covers, I also quit fighting the books on the floor. Now we have yet another war. This one concerns his bedspread. His nice new bedspread. I noticed something funny about it one day as I helped him make his bed or change his sheets….I don’t remember. But I do remember that something wasn’t right about his bedspread on one side. I pulled and tugged, only to find that the whole right side was tucked in, like a sheet. But you don’t tuck bedspreads in like you tuck in sheets. Aaron noticed me looking at the bedspread as I tried to figure out what was wrong with it. “Mom, I like stuffing it,” he said. “Ah, stuffing it,” I replied as I began to understand what he had done. “Yeah, I stuff it,” he went on. Well, I proceeded to unstuff the bedspread as we made his bed. I explained that we don’t tuck bedspreads in like we do sheets. And I explained that bedspreads are made to hang down nicely, all smooth and pretty, and not be tucked in. “So I shouldn’t stuff it?” he asked. So you can guess that over the next few weeks I have often found that his bedspread has been stuffed. I have then unstuffed it. But at night, as he and I get his room ready for bed or maybe after I leave the room, he stuffs the bedspread again. The other night he saw me staring down at the stuffed bedspread once again. I looked at him and didn’t have to say a word. “You mean you don’t want me stuffing it because you can’t see it?” he wanted to know. And I told him it was something like that. Explanations don’t matter one bit to Aaron, I have learned. Pretty hanging bedspreads matter not at all to him, either. So today I found once again that his bedspread had been stuffed. I asked him to please tell me why he stuffed it. Aaron doesn’t like his feet coming out halfway under the blankets. I didn’t even bother to ask him what position he had to be in for this to happen. I know that we are in another war and that Aaron will win this bedspread war as he also won the war of the order of the covers. I will make his bed the way I want it made on the days that I have the opportunity, but otherwise, stuffed it will be. I’m just thankful that Aaron makes his bed, to one degree or another. And maybe we’ll come to a compromise…..stuffed at night, unstuffed in the morning. A sleeping bag on top of his bed is sounding better all the time, actually. Author hesaidwhatksPosted on February 18, 2016 February 28, 2016 Categories Adult Autism, Asperger's Syndrome, Change, Special Needs AdultsLeave a comment on Stuff It! Aaron had a seizure at 4:30 this morning. It was around two minutes long, shorter than some but always too long. No seizures at all is definitely preferred, but that doesn’t seem to be what God has planned for Aaron in his life. His nocturnal seizures are why Gary and I still sleep with a baby monitor on our nightstand. Aaron knows that I go into his room when I hear a seizure and that I’m there to help him as needed. Aaron got out of bed around 7:00. I would need to look in his log book that he keeps to see the exact time. OK, I just snuck in his room and took a peek. He wrote down his getting out of bed time as 7:02. Isn’t he funny and amazing? He drank his three cups of coffee, as always…..and he bugged me about a fourth cup, as always. He said his head hurt, too, as always it does after a seizure. I can only imagine. And as always after a seizure, he decided to go back to bed. He told me his plan, but he wasn’t forgetting about that fourth cup of coffee. “Can I have a fourth cup when I get out of bed?” he hopefully asked. And I gave him some hope that he could. He has no idea what all I would gladly do for him on these seizure days. I try not to show my hurting heart generosity too much, either, because good old Aaron will jump on that like a tick on a dog. Forget the fourth cup of coffee! Let’s go for five or six! After Aaron had the assurance that a fourth cup of coffee was a real possibility, he started to walk away. But he came back to the top of the stairs, one more request on his mind. “Can you make sure I don’t have another seizure in bed?” he asked me. Oh, if only I could! I might have to think about granting a fourth cup of coffee, but if I could grant that my son have no more seizures then I would do it in a flash. I knew what Aaron meant. I try to get him to express himself more clearly, so I asked him how I was supposed to do that. “Can you hear if I do?” he clarified. “Yes, I’ll hear if you do,” I answered. 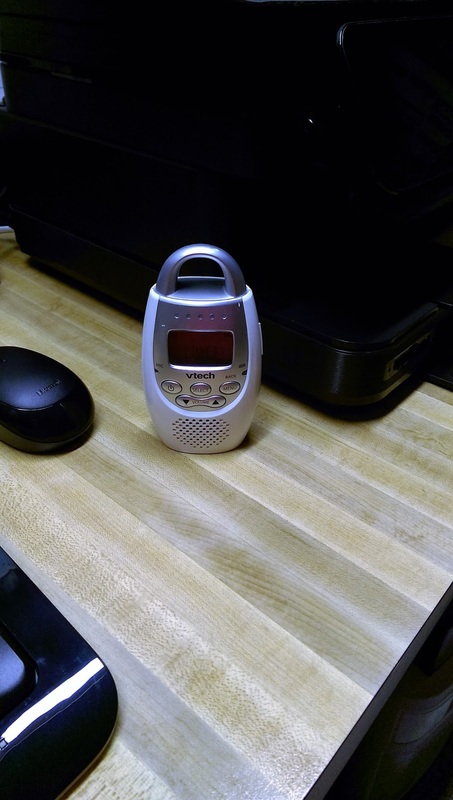 I assured him that I had the baby monitor on right beside me and that I would be listening. He was satisfied with my answer and with the knowledge that Mom was keeping her ear open, so off he went to bed. It’s sad to see that Aaron shows this fear of having a seizure. I don’t blame him one single bit. He doesn’t remember the seizures, but he’s seen friends at his day group have them and so now he knows what they look like. And he certainly knows what they feel like when he wakes up with a bad headache, sometimes a bitten tongue, losing his sense of taste, and other complications. It’s a very hard thing to see your child endure this. Harder still to see your usually unexpressive adult child begin to verbalize his fears. Victory in the verbalization…..sadness in the expressed reality. I am Aaron’s strength right now. I am his comfort and his hope. Me….and the baby monitor. Aaron is depending on us to be there for him and to help him if he has another scary seizure. This morning I had planned to write about Nehemiah and the guarantee that he gave the children of Israel as they built the wall of Jerusalem. I didn’t know I would have this illustration from Aaron. I would rather not have it. I would rather use another example from some other scenario in my own life that doesn’t involve him. But this is where God has us. This is His sovereign plan, one that I trust even when it hurts. The Jewish people were rebuilding the wall of Jerusalem, but there were enemies who didn’t want them to succeed. These enemies used words of discouragement and ridicule, but when they saw that the Israelites were serious about rebuilding the wall they changed their tactic. The enemies became intimidating, threatening to kill not only the workers but their families as well. The Jews became scared. The enemies’ threats were working. In Nehemiah 4:10, it was said that the worker’s strength was failing. That word, “failing,” meant to stumble or totter. The workers were literally tottering under not only the physical work they were doing, but especially they were stumbling emotionally and spiritually under the continued threats they were facing from their enemies. This verse has been on my mind for a couple weeks now. I’ve had some fears and concerns in my life. Health issues for Aaron, for Andrea, for Gary. Aaron’s behaviors that impact him and us so much. Andrew adjusting to a difficult new job. So many other things that jump around in my brain during the dark night hours when I’m unable to sleep….. I could name fears that I know so many of our friends are experiencing. Life has changed in a moment for some. Then there’s the continuing impact of those changes. Strokes….dementia…..upcoming surgeries…..serious infections…..the diagnosis of a child with a potentially life changing syndrome…..ongoing multiple children with special needs….exhaustion…..job uncertainties…..
Our life stresses are like the enemies of the Jews in Nehemiah. They surround us, threatening us with their potential or certain life changes. We sometimes stumble under the burden of it all. Fear is very debilitating. Our mind goes places it shouldn’t but it’s so hard to keep from doing that. This is why Nehemiah’s words have meant so much to me lately. I need to refocus my focus. I need to choose what I allow my mind to dwell upon. The answer is simple, but difficult, because the enemy wants me to stay glued to my fears and my worries…..both the known and the unknown. The Lord Who is GREAT and Who is AWESOME!! God’s got this….all of this. Whatever the enemy is throwing at us, whatever we see around us, whatever we hear in our head in the dark of the night….is NOT what we are to remember or to dwell upon. Our God is great and He is awesome. The battle is His, not mine! And so I fight, but I’m not the one fighting. I am allowing God to fight for me as I pray and give Him my battles and my fear and my worries. When I feel that familiar fear being thrown at me from the enemy outside the walls of trust, I remember and I remind myself that God is the One Who will fight for me. The Lord Who is GREAT! The Lord Who is AWESOME! I’ll hear you and I’ll be there if you have another seizure, Aaron. “Can you be sure?” he asked. “Yes. I’ll be sure,” I answer. I’ll hear you and I’ll be there in your fears, God says to me. “Can you be sure?” I ask. “Yes. I’ll be sure,” He answers. Author hesaidwhatksPosted on February 6, 2016 February 28, 2016 Categories Adult Autism, Answered Prayer, Asperger's Syndrome, Epilepsy, Faithfulness, Fear, http://schemas.google.com/blogger/2008/kind#post, Special Needs Adults, Special Needs Children, Strength, Trials, TrustLeave a comment on Can You Be Sure?